Scenes inspired by the traditional art of India’s Warli people illustrate a retold Panchatantra tale about a jackal who falls into a vat of dye. 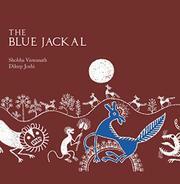 Chased by village dogs, pipsqueak Juno the jackal blindly jumps into a vat of indigo. His bright new color so frightens the other animals in the wild that he proclaims himself king. But when he hears his banished jackal clan howling at the moon, he joins in—thus betraying his true nature to the other creatures, who angrily drive him away. Viswanath embellishes more-traditional versions both with added details and by casting the tale into lumbering verse: “Juno was terribly puny and lean, / and the bigger jackals were really quite mean. / They laughed at him cruelly for being so skinny, / calling him names, like sissy and ninny.” (She also follows the lead of most modern renditions by allowing the imposter to survive rather than being killed by his erstwhile subjects.) Drawn in white on dark, monochrome backgrounds, the illustrations are large-scale scenes with freely placed figures of animals and foliage that are small and often stylized beyond easy recognition. They are striking, but the visual narrative they convey is not easy for readers from outside the culture to parse.